You’ll be the envy of your friends in this Heritage Jersey from our 2017 Australian Kangaroos range. Made from quality materials and extremely comfortable to wear, this supporters jersey is a stylish tribute to the heritage of the Australian rugby team. The Kangaroos have represented Australia in rugby league since 1908 and our Heritage Jersey from Canterbury’s 2017 Australian Kangaroos range pays tribute to their long and illustrious history which includes 10 World Cup wins. 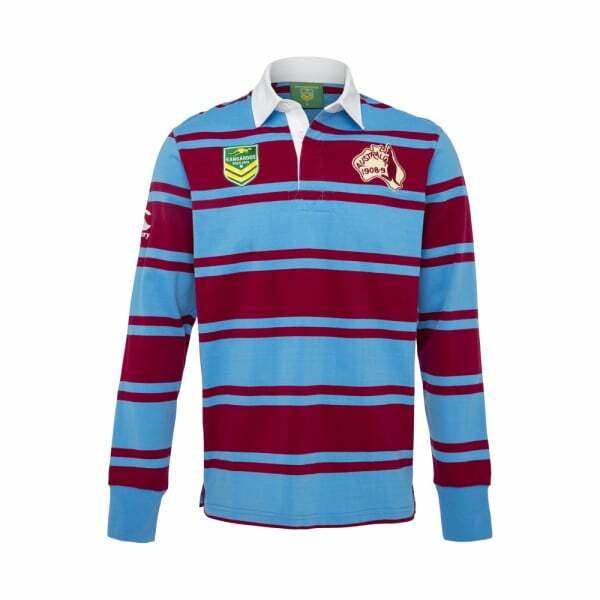 This high quality jersey in yarn dyed stripe is made from a soft blend of Polyester and Cotton and features a button down placket with cotton drill collar and rib cuffs. Complete with embroidered sponsor and team logos and iconic CCC branding, it marks the wearer as a proud supporter of the green and gold and a member of the elite Canterbury community of players and supporters.